Promotional Desk Pads are a great long term way to draw attention to your business as well as being a most useful office item. Litho printed in full colour to ensure the highest quality finish and available in a choice of A6, DL, A5, A4 and A3 sizes. Printed onto premium grade 100gsm white paper; there is a choice of 50 or 100 sheets per pad with identical printing to all sheets, glued to either the long or short edge and supplied with a grey hard board back. Desk Pads are a very popular promotional product that look great when printed with your company logo and contact information. 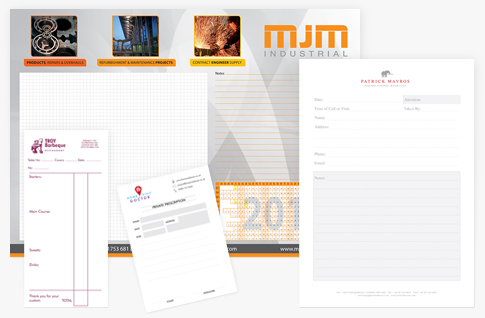 Many customers opt to have a 12 month calendar printed onto their pads which makes them a very useful office item. They are perfect for sending to clients or giving out at events and provide a subtle reminder of your business throughout the year. What other uses do Desk Pads have? Many businesses also use them as order pads, customer forms or for hand-written invoices where a duplicated copy is not required. Please visit our NCR Pads page if you are looking for duplicate pads.